Tech21 Impactology™: innovators in impact protection have teamed up with HEXUS to give you a chance of winning an iPhone 6 16GB smartphone protected with the brand-new Tech21 Evo Mesh case featuring FlexShock™. Our grand prize includes: Apple iPhone 6 16GB smartphone and a Tech21 Evo Mesh case. And that’s not all, because we will also be giving five runners-up an iPhone 6 Tech21 Evo Mesh case. Just let us know which colour you would like from Smokey and Red, Clear and White or Blue and Grey – and we’ll get it sent out to you. Tech21 is the only company to offer Impactology™ cases, which provide ingenious impact protection to mobile devices with full access to all the functionality and ports. Thanks to the unique scientifically proven impact absorbent polymers like FlexShock™ the cases remain slim and tough. Hint: You can find the correct answer at Tech21.com. The competition winner will be picked at random from all eligible entries that arrive by midnight of the closing date, February 4th, 2015. The winners will be notified via email by February 11, 2015. The winner must claim their prize within 7 days of the promoter sending notification. If the prize is unclaimed after this time, HEXUS reserves the right to offer the unclaimed prize to a substitute winner selected in accordance with these rules. The first prize is an Apple iPhone 6 16GB smartphone (UK model) and a Tech21 Evo Mesh case. 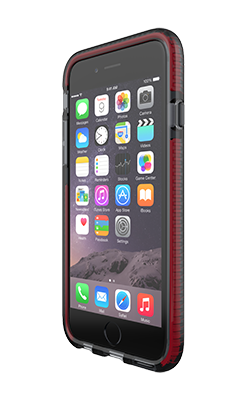 Five runners-up will each receive an Apple iPhone 6 Tech21 Evo Mesh case. I want Smokey & Red. Tech21 Evo Mesh case. Really Excited! Cant wait to have one! Thanks a lot Tech21 & Hexus! Thanks Hexus.net and Sponsors for this opportunity. If i can choose, I think Smokey & Red is a great choice. If I win, I'd also choose Smokey and Red.